George Mathews didn’t let a hernia take him out of the game. Pictured: 10 months after hernia surgery, George Mathews throws the 56 pound and 98 pound hammer on his way to winning the 2018 US National Ultraweight Pentathlon. With a packed competition schedule, 75-year old champion hammer thrower George Mathews couldn’t let a hernia slow him down. The six-time world champion and USA Track & Field Masters Hall of Fame inductee continues to excel in competition even after a hernia repair at Cascade Hernia & Surgical Solutions. 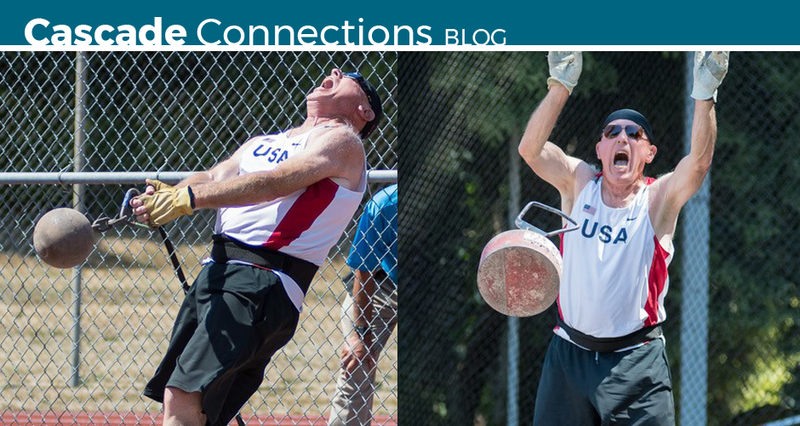 The hernia could have been a long-term roadblock to competing in the hammer throw at the highest level, but George researched online and found Dr. Robert C. Wright. “I needed to find the best care I could to get me back into action, doing what I love,” he said. George underwent hernia surgery in October 2017 and recovered within months. He was back to competing that spring, then won the 2018 US National Ultraweight Pentathlon in Seattle in August. Nicknamed the “Baby Whale” during his tenure on the St. John’s track and field team in the 1960s, George wowed the hammer throwing community with his ability to compete with the best despite his smaller stature and weight relative to the competition. After a brief hiatus from the sport while starting a family, George’s stellar athletic career has netted 6 world titles, 23 medals in 16 World Championships, and 51 US national championships in various competitions. He and wife, Kate, who ran a furniture supply company in Seattle prior to retirement, currently live in Edmonds. When he’s not travelling the globe competing, George coaches the next generation of aspiring hammer throwers in the Seattle area. Notably, he was coach and mentor to Eastlake High School’s Joe Ellis, who is the University of Michigan’s program record holder in the hammer and weight throw, a three-time all American, 2017 Big 10 Conference champion, and has a good chance of making the US or British Olympic team in 2020. Why Cascade Hernia & Surgical Solutions? George says he chose Cascade Hernia & Surgical Solutions at Meridian Surgery Center because of Dr. Wright’s reputation in the community and his confidence that it was best option for his procedure. “With my insurance, I could’ve gone anywhere in the nation for this procedure, and I chose to go to Puyallup for Dr. Wright,” he said. You don’t have to let a hernia take you out of the game. Whether you throw hammers, play soccer, lift weights, mountain climb, or just enjoy a nice stroll around the neighborhood, Cascade Hernia & Surgical Solutions can help you get back to the active lifestyle you enjoy. Learn more about hernia repair at cascadehernia.com or make your appointment for a consultation at (253) 840-1999. Appointments are often available the next business day.